Tooth Sensitivity: What Does It Mean? At some point, the majority of people will have tooth sensitivity. Sometimes called dentin hypersensitivity, this typical issue may impact over half of all Americans. Sensitive teeth may make it tough to eat a scoop of ice cream or a steaming sip of tea. Some people simply have dental sensitivity only sometimes, but others have persistent discomfort caused by dentin hypersensitivity. In any situation, you ought to speak with your dentist in Pearland, TX about your teeth if they are sensitive. Dentin hypersensitivity is also a sign of bigger issue, such as, gum disease or a cavity. If you are worried about your sensitive teeth, then schedule a consultation with our seasoned staff at Highland Dental Care and Ortho. and then keep reading to find out more about what causes tooth sensitivity and how to treat it. The tough outer layer of the teeth (the enamel) is intended to guard the inner pulp of the teeth (dentin), which is full of nerve endings. After the tooth is damaged or develops a hole, then the nerves within your tooth can be easily irritated. Many men and women feel sensitivity issues when they drink or eat anything that is particularly cold, hot, or sweet. Changes in pressure (for example, cold weather or flying in a plane) may also activate pain. 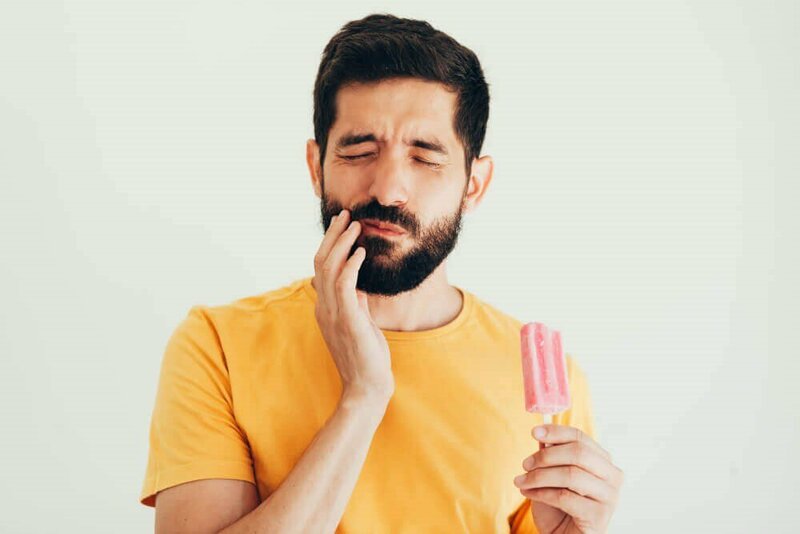 Sensitive teeth may be the end result of something that's easily corrected, such as brushing too hard or a whitening product, but it might also be an indication of a bigger problem, such as, gum disease or a cavity. It is crucial that you inform your dentist in Pearland, TX when you are experiencing sensitive teeth so they can identify and address the reason. There are people who are overbrushing. This takes place when you're applying too much pressure when you brush, you're using an abrasive toothpaste, or you are cleaning over three times every day. Your teeth may get weak from several things — decay, too much brushing, whitening, acidic foods and beverages, teeth grinding, and much more. Weakened teeth are more vulnerable to sensitivity as well as other issues. Among the most common signs of a cavity is chronic sensitivity. A cavity is decay in your enamel, which enables irritants to make it to the nerves inside the tooth. As soon as your gums recede from your teeth (generally the consequence of periodontal disease), the roots are visible. This also contributes to more sensitivity. Grinding your teeth (bruxism) may cause sensitive teeth. Usually linked to anxiety, teeth grinding breaks down the enamel so your teeth are more sensitive. When you are using a store-bought whitening kit, then you might discover your teeth are sensitive. Although this usually fades after a couple of days, it may be an indication your teeth are damaged, the bleaching gel is overly harsh, or you're using the kit too often. A crack or chip in a tooth can lead to sensitivity. If the enamel is damaged, then your nerve might be vulnerable. Many people have occasional sensitivity during their lifetimes. Just a little discomfort occasionally that might be mended with a special toothpaste or other household treatments. If your sensitivity stops, you still ought to tell a dentist at your next trip. They could have the ability to suggest products or home treatments that will help your sensitivity. In case you've got chronic tooth sensitivity, then schedule a consultation with a dentist. They'll start looking for the reason for your sensitivity, which might be a cracked or chipped tooth, a cavity, or a receding gumline. When they find the underlying problem, a treatment will be scheduled to relieve your sensitivity. When you have sensitivity in your teeth, then consider using less pressure while you are brushing, choosing a toothpaste that's especially made to reduce sensitivity, and brushing only twice every day. In case your sensitivity is brought on by bleaching your teeth using an over-the-counter kit, then ask your dentist for information on professional whitening choices. Highland Dental Care and Ortho. provides both kits to use at home and in-office whitening, which we can personalize to deliver great results with less sensitivity. Sensitivity brought on by decay, a chip in your enamel, or a cracked tooth might be fixed with a filling or crown. The crown or filling will protect the vulnerable nerve. For nocturnal bruxism, your dentist will usually suggest a customized night guard to wear when you are sleeping. Sensitivity from a receding gumline will often call for a periodontal therapy. This might be a scaling and root planing therapy or periodontal procedure for advanced gum disease. After a treatment is performed to address gum recession, you might also require gum grafts to repair your gumline. To steer clear of tooth sensitivity, be sure to schedule a yearly examination with a dentist in Pearland, TX. They will identify and cure issue like decay, periodontal disease, weakened enamel, and even more so they don't lead to problems like sensitivity. In your examination, it is also possible to ask your team to look at your cleaning technique to be certain that you're not using too much pressure. Additionally, try to limit foods and beverages that are acidic (citrus juices and fruits, soft drinks, and many processed foods) because this may damage your teeth. To help fortify your teeth, you might ask your dentist about getting fluoride rinses. If you want to stop or protect against tooth sensitivity, speak with a dentist in Pearland, TX. It might be as straightforward as modifying your nutrition or brushing technique. But you might require a dental filling, crown, or even periodontal therapy to deal with the underlying issue behind your sensitivity. Our seasoned staff at Highland Dental Care and Ortho. can help you build a customized treatment plan to alleviate your sensitivity and enhance your oral health. Speak to our practice in Pearland, TX to schedule an examination and appointment if you would like to fix your dental sensitivity.